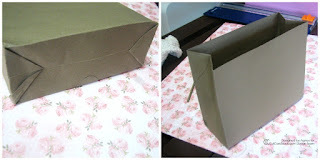 Hello all, today's project was "tweaked" a bit from a Pinterest project I saw where you make a bag/pouch or purse using an envelope. I do have to apologize because I didn't save the pin but browsing around I found something similar here. The tweaking part comes in when instead snipping off one of the envelope sides, you snip off the top when in landscape view instead. Ok, let me explain: take an envelope, close it shut with a strong adhesive, like score tape as I used on mine and, snip off about 1/8th of an inch from the wider side of that envelope. The envelope should be in a landscape view. The next step is to open the envelope (minding the score lines) while forming a flat base as on left figure; next fold in the bottom triangular flaps and add strong adhesive on flaps to close shut, as on figure 2. 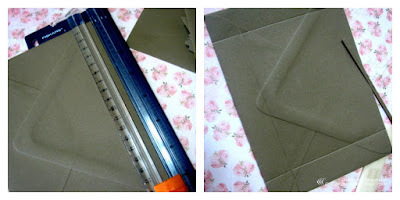 The sides are folded along the score lines to gusset the inside if needed. It should look something like the above pics. And there it is, so very simple! I love making simple projects because they are so handy when in a hurry. Time to decorate: Above are the embellishments I used to decorate the bag or purse (as I called it) when I decided to turn the envelope bag into a purse. A Shaker Purse, that is. The pretty zig zag or commonly named chevron paper will be the background. It is from the same "Crush" 6 x 6 pack I used on my last project. 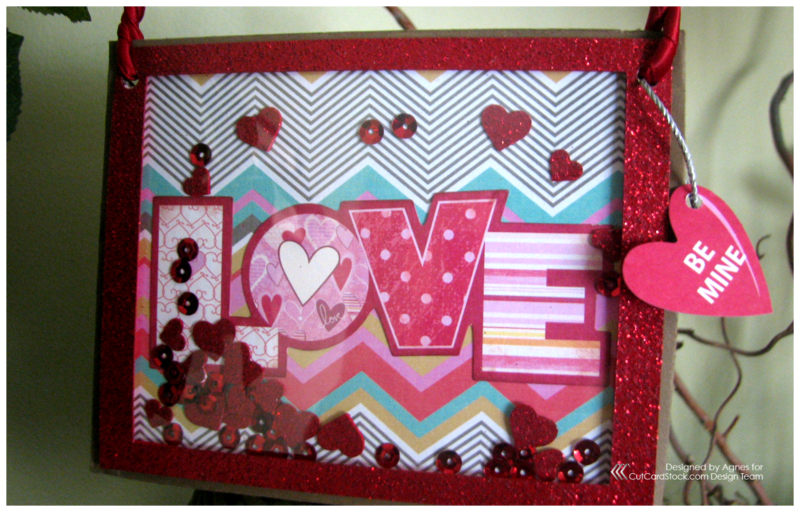 For the frame and hearts, I used this red glitter cardstock (it won't leave glitter all over). The hearts will be the shaker pieces along with some red sequins. Because I needed the hearts be double sided, I just punched a few more hearts and used them as the backing for the previously punched hearts. 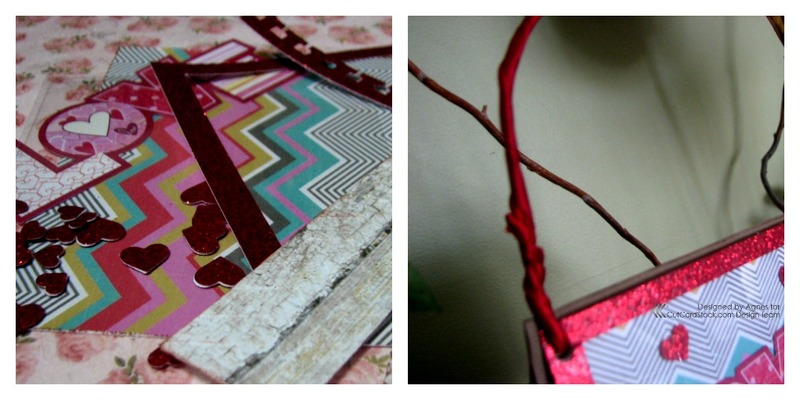 the handle was made with thin wire covered with ribbon. A few more pics from different angles and the "Shaker Purse" below. Adorable! And you can fill it with whatever treats you want. I was thinking a long handle would have been nice too and let a little girl use it to hold her candy to share. Thanks a bunch for stopping by today and, I hope you find this shaker purse worth the try. 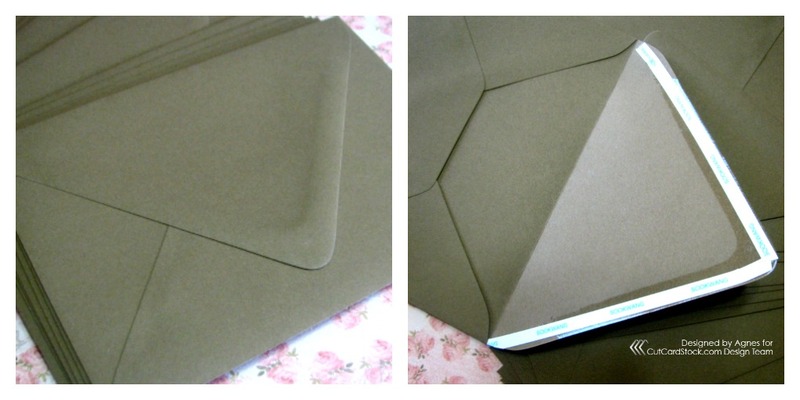 Most of the supplies used are linked, including the must haves: glitter cardstock and the envelopes which are size A7 and the color is a beautiful brownish color called Rubbed Sage.